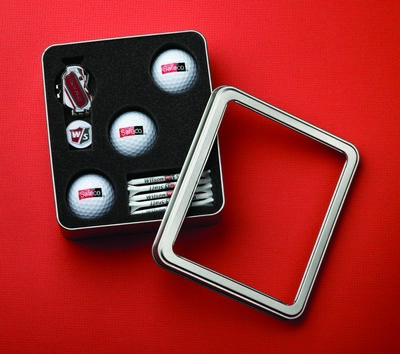 Our Wilson 3-Ball Display Box offers customization ability to create impressive Business Giveaways with your brand logo. Make sure that your potential customers get a glimpse of your brand impression by handing over the Wilson 3-Ball Display Box at the next promotional event! This box features three imprinted Wilson golf balls, six tees and a ball marker. The box is made of zinc while the balls feature rubber and surlyn construction. A great giveaway for outings, golf themed events and tournaments, this box allows customizing the ball to your brand with your company logo, name and slogan. Display your brand impression with this display box!